For generations it was received wisdom in foreign policy circles that the United States was hated because we supported tyrants who repressed the "will of the people". The point of reception was originally the propaganda desks of Moscow. The theme was picked up and expanded on by every scribbler who hoped that if the British-backed monarchies of the Middle East fell, they would be replaced by proper Socialist republics. The kings fell, but were replaced by army officers who built their own wacky versions of Socialism. Some versions, like Gaddafi's, were wackier than others. Most were just banana republics. Despite their persecution of Communists and assorted domestic leftists, these Socialist republics had no difficulty allying with the Soviet Union. And at no point in time, at least not until the fall of the USSR, did the foreign policy experts suggest that the Soviet Union was in danger of alienating the Arab Street by supporting tyrants. But when it came to the United States and the Shah of Iran that was a major concern. It was also a major concern when the Egyptian Arab Socialist government switched from the Soviet camp to the American camp. 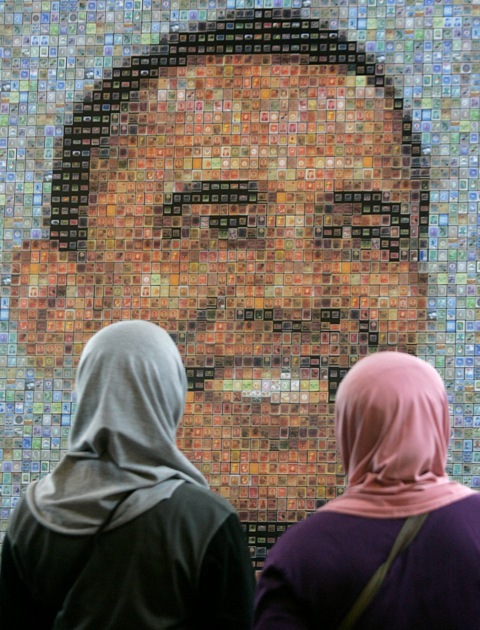 That "concern" under Obama culminated in the overthrow of Mubarak, and a number of other allied governments tossed aside to make way for the Islamist will of the people. 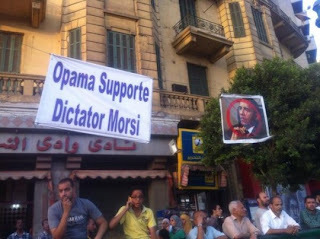 And now, after Obama's Cairo speech, which singlehandedly brought peace to the region, if by peace you mean a state of permanent protest, looting and rioting, Tahrir Square is full of signs denouncing Morsi, the Muslim Brotherhood member who won a democratic election, as an American puppet. The phenomenon is hard to explain for all the experts who insisted that we were hated because we supported Mubarak, not because we were hated for who we were. The truth however is that we were not hated because we supported Mubarak or Morsi. Mubarak and Morsi were attacked by their opponents in every possible way. One of those ways was by accusing them of being our ally. The foreign policy experts who had gone looking for love in the Muslim World had entirely missed the point. We weren't hated because of our foreign policy. Our foreign policy is hardly known or understood in the Muslim World except as a series of conspiracy theories. America is not hated because of its foreign policy. Its foreign policy is hated because of it. Its allies are hated because of it. The foreign policy is the egg and it comes from the chicken. No one hates the egg on its own merits. They hate the chicken. If it's associated with us, it is assumed to be bad. Why do they hate America? The fact that we have an entire class of people dedicated to answering such a stupid question is a testament to our insularity and the utter ignorance of our leadership. The fact that they repeatedly get the answer wrong is even more stunning. It's a question that any average person could have answered a few generations ago. They hate us because we're foreigners. Not only are we foreigners, but we're rich, powerful foreigners who repeatedly get involved in their politics. Getting involved in the politics of any other country is bound to make enemies. There is no will of the people. There are only different factions. There are winners and losers. Backing anyone, including the abstract notion of democracy which in its practical application leads to someone winning or losing, is bound to make enemies. There is no way around it. That isn't to say that we don't have legitimate interests in Egypt. Legitimate to us, at any rate. But being loved is not one of those interests. Or at least not a realistic interest at any rate. Obama's love nation building program in the Arab Spring was even more doomed than Bush's attempt to bring good government to Iraq. It would be easier to fix corruption in the Muslim World than to make them love us. The hatred, resentment and conspiracy theories are in their own way a compliment. The other side assumes that we are rational actors. That we manipulate their governments and societies for our own strategic, political and economic interests. That is what they try to do to us through organizations such as the Muslim Brotherhood. Unfortunately we are not rational actors. We are insecure globalist philosophers looking for international love in all the wrong places. All the conspiracy theories assume that we know what we're doing. We don't. Instead of looking out for our interests, we formulate grandiose plans for transforming the region by applying our political philosophies to societies and cultures where it doesn't fit, because our political class operates on cliches and rote truisms that would embarrass a seventh grader. The Egyptians assume that we want territory, bases, trading concessions or at least power. But no. We want to achieve regional stability by empowering popular voices. We want to teach the world to sing. We want everyone to follow international law and attend our conferences to boast about all the improvements in LGBT rights they made this year. In other words, we're something between fanatical hippies with nuclear missiles and idiots. In Tahrir Square they assume that if Obama is backing Morsi, then the two men have come to some sort of arrangement that is in America's interest. There is no way to convince them otherwise because it would require somehow making them understand that our government is run by people who walk a fine line between treason and idiocy, to whom the very notion of national interests is an obscenity. You could get every member of the faculty of Al Azhar to sit down to a repast of beer and ham sandwiches before you would get a single member of Obama's foreign policy team to agree that American national interests should trump experimenting with democracy in Egypt. A small measure of our stupidity is the simple fact that we have an expert class whose explanations for why we are hated all involve our foreign policy and none of them involve the simple fact that most countries hate other countries. Why would Egypt or Pakistan or any of our other Islamic Juliets standing on the balcony in full Burqa in the desert wind, not hate us? Even if we took Islam out of the picture by converting wholesale, it wouldn't make much of a difference. Most of the Muslim world also hates each other. They probably hate each other even more than they hate us and it's not because of anyone's foreign policy. It's not accidental that the two truisms in foreign policy circles are that we are hated because of our support for dictators or for Israel. The former was a propaganda ploy of the Soviet Union looking to undermine American foreign policy through moral insecurity. And the legion of State Department stooges and expert journalists who did Moscow's bidding helped make that a fact that no one would argue with. The latter came from further south out of Saudi Arabia and parts nearby with the intention of driving a wedge between Israel and the United Stares, to make Washington even more reliant on the Saudis. But lies and errors don't dig their way in that deep without a weak point. And the American weak point is that same weary liberal globalism that believes the brotherhood and sisterhood of man is just a few more regulations, microfinance seminars and UN sessions away. The liberal foreign policy experts want to head an empire. But they want it to be some sort of voluntary empire based on moral superiority that doesn't require them to conquer anyone or dictate to anyone. They want all the fun of running the world, but they don't want to get any blood on their hands or stains on their worldview to achieve this benevolent dictatorship of the planet. In a sense the conspiracies about the United States are right. And they're wrong. There are people at the helm who manipulate other governments for their own interests. But those interests are not national. They're post-national. abuse international or multinational power for the gross and petty concerns of their own nation. It isn't the welfare of the United States that interests them. It's the welfare of the world. Our elites want to be loved. They don't want to rule over people who hate them. Their fondest dream is to have the peoples of the world acknowledge their moral superiority and the benevolence of their tyranny. They don't want America to be liked because they care about America. They want America to be liked, because they want to be liked. America is just their footprint on the world stage. Along with Europe and the rest of the Anglosphere. The Muslim World finds such a worldview bizarre and irrational. Its leaders may deploy Islamic rhetoric which walks the fine line of post-nationalism, but that is only because they see Islam as a broader form of tribal unity for the Arab and even the non-Arab peoples of the Muslim World. Like their liberal counterparts, they are interested in the world. But unlike our leaders, they aren't about to give up their interests and allegiances to get there. They don't want to be loved. They want to be feared. You accurately describe what is, like so much of American Leftism, essentially the viewpoint of an adolescent. The idea that historical forces thousands of years old can be reversed by a new generation more positive, accepting, and of course much smarter than any before it. These are the same people still wearing Chuck Taylors (made in Asian sweatshops by Nike) at age 35+. I have trouble believing that Hillary, Kerry, Hagel, and so many other liberals want to be loved by the world for anything in particular. I wouldn't doubt that they would prefer being adored in order to have whatever they think "power" means, but to be loved for they sake of being loved? These are con men/women, some are outright criminals. What Obama really wants I have no idea, there is just too much crazy stuff going on there. Except at home: here in the U.S. they're perfectly happy to make large segments of the populace hate them, so long as they get to rule over us. "There is no way to convince them otherwise because it would require somehow making them understand that our government is run by people who walk a fine line between treason and idiocy, to whom the very notion of national interests is an obscenity. You could get every member of the faculty of Al Azhar to sit down to a repast of beer and ham sandwiches before you would get a single member of Obama's foreign policy team to agree that American national interests should trump experimenting with democracy in Egypt." This is one of Daniel's wickedest remarks. It's for the books because it's so true. Wanting to be loved by people who would rather see you dead is a neurosis peculiar to our foreign policy craftsmen. But why limit it to Obama's foreign policy team? I can't think of a single foreign policy team under any president going back to FDR that got everything right about what was going on elsewhere in the world and what the U.S. should do about it, if anything. 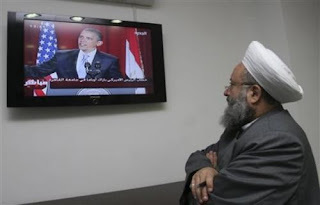 I must add that the Muslim world hates the U.S because it is the U.S. I don't think they're blind to its value as a (now) semi-free nation. The U.S. is good, they hate the good for being the good, and want to destroy it because it is the good. That's the long and short of it. It's all about money, always. They promote racism and wars, to make money, and they don't care who dies, and they will never allow Section 8 Housing in Martha's Vineyard because they live way above the peasants. Other than that, anything goes to make money. I watched a young spokeswoman (Jen Psak) from the U.S. State Department yesterday make a statement about Egypt. It was bizzarely incoherent and inonsistent. Psak - like most State Department employees - seems to have been selected on the basis of having minimal intelligence and zero knowledge of the Middle East. So........is Kumbayah the new US national anthem? Daniel, as always, is right on. Ms. Psaki is probably next in line for WH press secretary. Earned her ups in Mr. Obama's 2012 campaign and is being seasoned in Foggy Bottom. Is well qualified in the bromides and nostrums department. Will probably be hard pressed to note any change. Fanatic hippies w/nukes or idiots -thanks for that one. Can you imagine the discourse of the saudi princes after a visit from shrillary or Karry? I can hear the guffaws from here (MidWest). This article owes a hat tip to obummercare and imagrating bill, two truly idiotic pieces of subterfuge benefiting very few. It seems to me the real leadership in America comes from bloggers like the Sultan of Knish, if writing with clarity can be leading with thought. They hate us because it works. So much sense in such a short space is rare. Thanks for a clear-eyed, and funny, view of the world. I have noticed that my friends from the Middle East (mostly business associates) tend to view people as friends or enemies. No middle ground. Seems to work for them. After 9/11 it was and still is hard for self-absorbed Americans to understand that the terrorists did this for reasons that are entirely their own. It was not really about us and our foreign policy. The story of Qutb makes for good reading.